The research firm examines where EHRs, cloud, blockchain, telehealth, security and other technologies are today – and where they might be headed. 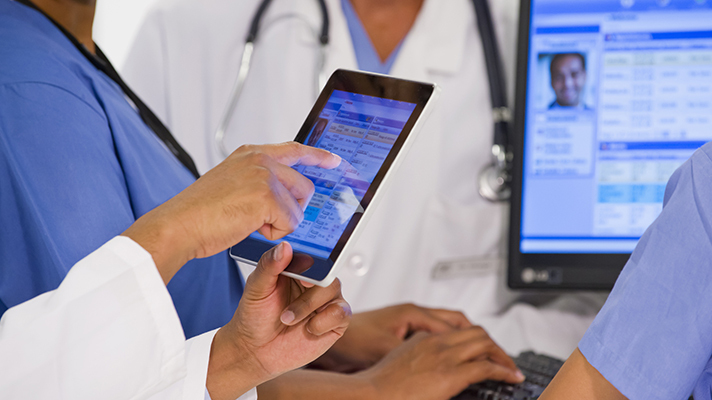 For National Health IT Week 2018, HIMSS Analytics delivered new research exploring some key trends, looking closely at established software infrastructure and emerging technologies alike. "What we're seeing as far as a state of the market is acceleration beyond the EMR," said Blain Newton, executive vice president of HIMSS Analytics. "We're seeing it manifest in a few different ways." Those post-EHR technologies and trends include blockchain, cloud computing, security, precision medicine, supply chain, telehealth and, of course, network infrastructure. Electronic health records. EHRs are a key piece of the health IT infrastructure and the market segment is very mature with near universal adoption, according to HIMSS Analytics data – but only 2 percent of hospitals have a single vendor enterprise EHR. Instead, the average system has 15 vendors across its affiliates — making the next issue a complex mess. "We're seeing migration past the EMR as a foundation as well as retrofitting how we create scale and secure infrastructure," Newton said. Interoperability. With mega-mergers such as Dignity and CHI and CVS Health and Aetna – as well as Amazon's partnership with JPMorgan Chase and Berkshire Hathaway – significant challenges are arising amid the hodgepodge of EHR vendors. "Creating a secure environment where interoperability can happen is not a challenge of desire," said Newton. "It's very technical." Telehealth. Whereas the U.S. has surpassed a 50 percent adoption rate for telehealth capabilities, the average hospital has upwards of five different products installed, meaning it has yet to widely reach enterprise-level deployments. The surprise HIMSS Analytics found in its data is that the highest adoption levels for telemedicine tools are among non-profit hospitals with 100 beds or fewer. "For a technology that the ROI is not yet entirely clear, you're seeing nonprofits with a very significant lead in adoption, presumably to reach out to rural populations," said Newton. "Either way, it's an unexpected view, we thought it would be large hospitals." When asked whether they plan to invest in telehealth in the next two years, 27 percent said yes, 18 percent said no and 55 percent said they weren't sure. Precision medicine. In contrast to EHRs' near-ubiquity and telehealth on the rise, precision medicine adoption today is limited. The top three reasons are a lack of funds, technologies, and the clinical expertise necessary to undertake such programs. That said, 45 percent of respondents to HIMSS Analytics research said they plan to expand precision medicine work, while 23 percent do not and 32 percent are unsure. Security. This should come as no surprise, but Newton said that "healthcare is absolutely a target," for nefarious attacks as 29 percent of breaches last year hit healthcare, a higher rate than any other industry. "Twelve percent of hospitals do not have basic IT security systems," Newton said. "That's a bit frightening because whether you're the Mayo Clinic or a rural provider in South Dakota, you're a target." Protecting health data is one of the reasons more hospitals are looking to the cloud. But it's not the only one. Cloud computing. Sixty-five percent of hospitals currently use cloud services in some capacity, and Newton said that it's expected the majority of EMRs will be cloud-based by 2020. Among the reasons healthcare organizations move to the cloud: 37 percent said it's for disaster recovery, while 25 percent said the cloud lowers current IT maintenance costs, another 25 percent answered that it'd sue to a lack of on-site IT staff or expertise and 13 percent do so to meet the need for a scalable always-on app or service. "There's a significant component just looking at baseline IT costs, regardless of the motivator, the cloud is coming, on-premise is a thing of the past," he said. "It has really shifted wholesale here because of efficiencies and levels of service. I would expect this to continue increasing." Blockchain. Blockchain is still in the hype stage, to be certain, though it also appears that some early days type of activities are happening with 50 percent of health org's either investigating or building a business case around Blockchain, and doing so with plans to run a proof of concept in the next 24 months. But payers, pharma and tech vendors are moving more quickly than healthcare providers, which may be hanging back to let the others figure it out first. Non-providers, in fact, are twice as likely as providers to conduct a proof of concept or pilot in the next two years. Patient-generated health data. This was another surprising finding. "Organization said they are at least moderately prepared for consumer-generated data," said Newton. While more than 80 percent of patients are already expecting to see data in their record, in fact, 67 percent of hospitals are looking to invest. Just don't expect it to happen quickly. "When we talk to CIOs, they flat out said this is an issue of data governance," he explained. "We don't believe we have adequate governance in place to manage consumer generated data." Supply chain. Acknowledging that a better name for supply chain in this context might be utilization management and resource stewardship, Newton described it as "one of the biggest things we see happening." Four of the top 10 predictive technologies are supply chain management related and hospitals should proactively invest in clinical infrastructure for tools that alert clinicians to risk or enable traceability that helps determine which products or people are safest and most cost-effective, as well as technology to enable learning systems. "I see this as becoming something significant over the next 18 months or so and becoming much more enterprise focused as folks look to drive down costs and improve care," he added. "We see this as a powerful new capability that organizations are looking to go after." Broadly speaking, the state of HIT today is a digitized system now in place and a renewed investment in infrastructure to harness that and drive emerging trends such as predictive analytics, patient engagement and population health on the road to value-based care. Some of it is being done on the EHR foundation while other work is more about retrofitting older technologies to create secure infrastructure scale that accordingly. "People are looking up and saying the infrastructure we put in place 10 years ago isn't robust enough today," Newton said. "It's a mix of true innovation and securing things built to support a tech stack from a few years ago."